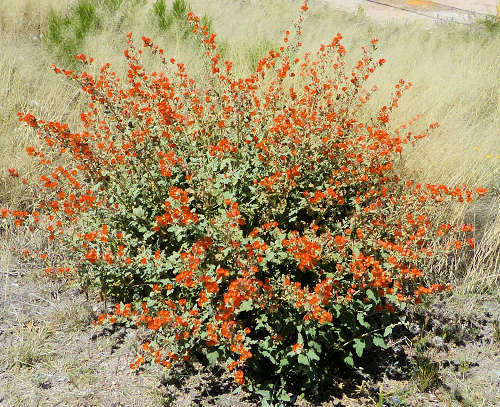 Form: A subshrub with a woody base and herbaceous stems. Mature Size: 3' high and 3' wide. 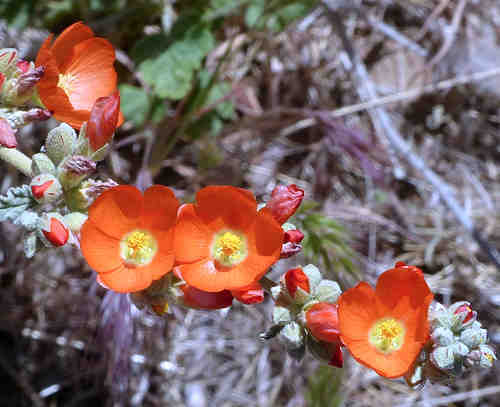 Flowers: Cup shaped, orange, red, pink, or white, five petals, many short stamens. 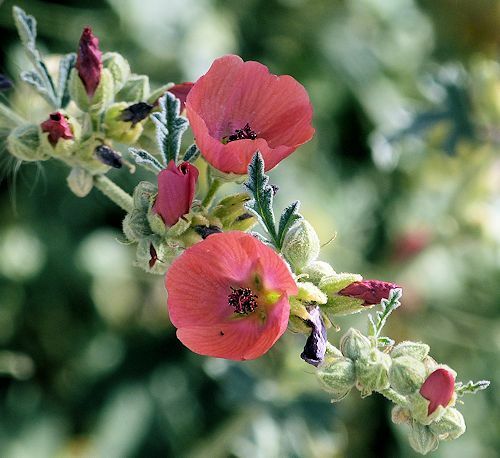 Bloom: Nearly year-round in frost-free regions, most heavily in the spring, then sporadically the rest of the year. It blooms spring through fall in regions with freezes. Leaves: Green to silver-green, hairy, scalloped wavy edges, deeply lobed, often with three lobes, variable. Wildlife: Attracts bees. A caterpillar food plant for the Painted Lady and other butterfly species. It will be browsed by wild mammals when irrigated. Toxic / Danger: Hairs on leaves may cause eye irritation if they attach to fingers or become airborne. Origin: California, Nevada, Utah, Arizona, and Mexico. Water after becoming established: Once a month. Supplemental water improves blooming. Soil: Well drained, dry, low in organic content, pH 6.6-8.5 (neutral to alkaline). Prune: Cut back to 6" high, in early fall in frost-free regions, or after the last winter frost. Wear gloves. Propagation: Seed. It usually reseeds. 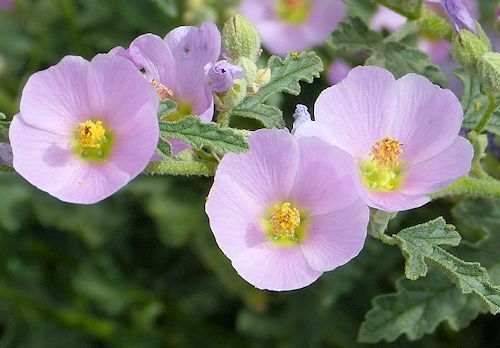 This plant is a member of the Mallow family (Malvaceae). Several commercial varieties are available.